This past September, the Toronto Urban Film Festival (TUFF) announced its 2010 list of award-winning, minute-long silent films. 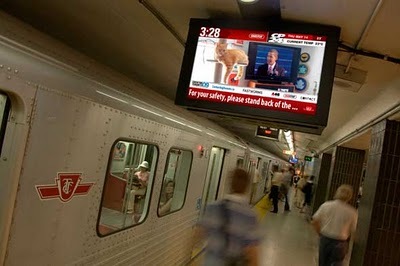 TUFF films, produced by new and established artists around the world, run in loops on the Toronto Transit Commission’s (TTC’s) platform-level information boards, operated by OneStop Media. The boards have no speakers, so any film shown on them must run silent. This year’s ‘The Medium is the Message’ category-winner, and third-place winner overall, was Axiom. Axiom is a tough little film to get your head around. Not because it’s deep or not deep, but because it burdens viewers with particular responsibility. It’s not enough to interpret Axiom; you also have to decide what you’re watching—a poem, maybe; decorative images; something analytical—and commit to that decision, at least for 60-seconds. Online, you have the luxury of watching the film again and again, taking different perspectives if you wish, focusing on different elements of the image each time, but in the subway tunnel, things would’ve been different. I believe many transit riders, even very similar transit riders, observed Axiom and took from it very different experiences, because they weren’t watching exactly the same thing. Now, I’ve had the opportunity to correspond with the film’s creator, Philadelphia-based artist Sally Grizzell Larson, and she’s given me the insight that comes with better background information. But more detail about the film’s various source materials doesn’t generate answers. Axiom is not the sum its parts; it’s the continuous summing of them. … I played the film on my computer, shooting parts directly from the screen, and had no problem with the fact that the image quality would be less than stellar, especially since the original isn’t. 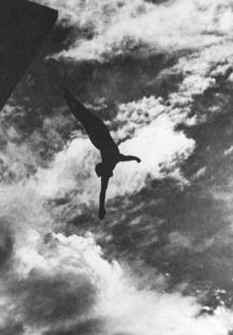 Riefenstahl’s images make it quite clear where—and into what—the divers are diving, while Larson’s divers often seem to fly through a blank ether, itself a memorable and unsettling image. Axiom focuses on the suspension of these physical artists in their moments of creating. We know gravity is irresistible. The end result of every dive—the splash in the pool—is inevitable, we know that too. Success is not flight, but the expression of poise, creativity and beauty before the end, while creating an illusion of not falling at all. Manufactured forms are geometric and we respond to geometry because geometry communicates to us a feeling that some higher dispensation is being subserved, which thus becomes a pleasure of the mind and a feeling that we are satisfying the laws that govern our being. Now it’s a poem—its words repurposed by the space they share with Riefenstahl’s divers. Reading it, you’re now tempted to ask questions. Is a ‘dispensation’ a higher law? A law greater than physical laws? Is there also a will to which we are being subsumed? Does the divers’ split-second, illusory artform pay fealty to that will, or symbolize defiance of it? How does the geometry of a manufactured form (the invariance of its shapes and boundaries) imply a world subsumed to some higher dispensation? Wouldn’t anything imply that, if we chose to observe it with that in mind? And what, then, do we have in mind when a diver looks weightless to us? Do we forget that he’s always in the process of falling? The repetition of moving forms in equally timed segments: We are lulled and seduced. Like any other high functioning receptor, the human brain is indiscriminate about what it picks up. How then do we resist the seemingly benign when we’re mesmerized by it in spite of our better judgement? I don’t know what that means. Yes, the brain detects indiscriminately, but Larson’s use visual space forces discrimination immediately and repeatedly—we begin parsing it from the opening frame. What I do know is that an ‘axiom’ is a truth held to be self-evident, and perhaps that’s the real key to Larson’s film. Describing her working method, she told me, “the process of putting things together is messy and unsystematic. You just know, from experience, what makes sense, what works.” I trust Larson’s skills, so I believed there were truths to find in Axiom. And I believe I have found some. And that process, entirely mine, has been messy and unsystematic. It has also been well worth doing. Click here for my review of 2008 TUFF winner, Smile. Here’s a link to more about Sally Grizzell Larson.